This chromoprotein from the coral Stylophora pistillata, spisPink (also known as spisCP), naturally exhibits strong color when expressed. The protein has an absorption maximum at 560 nm giving it a pink color visible to the naked eye. 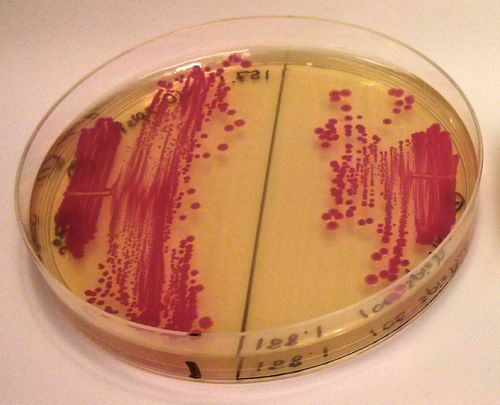 The strong color is readily observed in both LB or on agar plates after less than 24 hours of incubation. The protein spisPink has significant sequence homologies with proteins in the GFP family. iGEM2013 Uppsala: The images above show E coli constitutively expressing spisPink BBa_K1033925 from the high copy plasmid pSB1C3 from the promoters J23110 (left) and J23106 (right). Stylophora pistillata. The protein was first extracted and characterized by Alieva et. al. under the name spisCP (GenBank: ABB17971.1). This version is codon optimized for E coli by Genscript. Alieva, Naila O., et al. "Diversity and evolution of coral fluorescent proteins." PLoS One 3.7 (2008): e2680.